Yanis Varoufakis’s Account of the Greek Crisis: a Self-Condemnation — Part Five: The Varoufakis-Tsipras Line was Doomed from the Word "Go"
In his book Adults in the Room, Yanis Varoufakis gives us his version of the events that led to the Tsipras government’s shameful capitulation in July 2015. In the fifth part of a series of articles analyzing the book, Eric Toussaint looks at the earliest days of the Tsipras government. 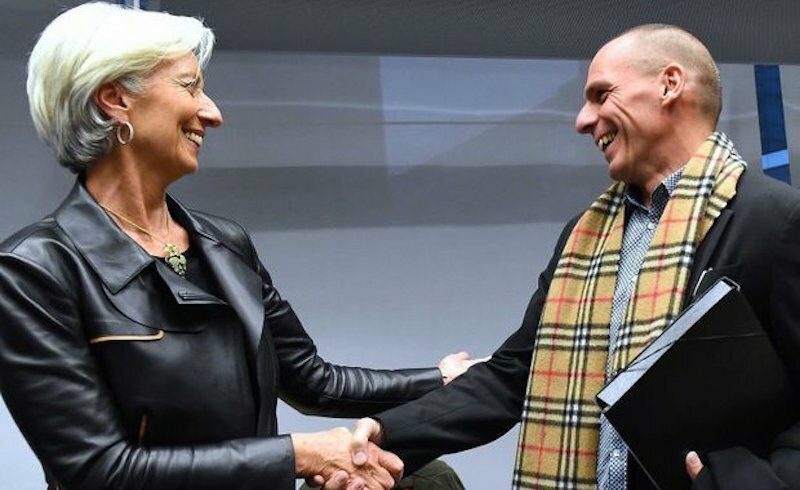 IMF head Christine Lagarde with Yanis Varoufakis. First published at CADTM. Translated by Suchandra de Sarkar, Mike Krolikowski, Christine Pagnoulle in collaboration with Snake Arbusto. Disclaimer: This series of articles on Varoufakis’s book, Adults in The Room: My Battle With Europe’s Deep Establishment is a guide for left-leaning readers who are not happy with the dominant narrative meted out by the mainstream media and the Troika-controlled governments. This is also a guide for readers who are dissatisfied with the former Finance Minister’s version. 1 As a counterpoint to Varoufakis’s story, I have highlighted events that he is silent about and I have expressed different views on what he should have done and what he did instead. My story runs parallel, and not opposite, to his. It is crucial to thoroughly analyse the policy implemented by the Varoufakis-Tsipras government because, for the first time in the 21st century, a radical left-wing government was elected in Europe. If we want to avoid another disaster, it is absolutely vital to identify the flaws and understand what went wrong. This critique of the Greek government’s policy in 2015 is not primarily meant to point out the respective responsibilities of Tsipras or Varoufakis as individuals. It is imperative to analyse the politico-economic orientation that was followed, so that we can ascertain the causes of failure, understand what could have been tried instead, and learn what a radical left-wing government can do in a country in the periphery of the Eurozone. This section will take a look at the Tsipras government’s early days, during which Yanis Varoufakis pursued his negotiation tactics with the European creditors. We will find out that this strategy was ill-fated because Varoufakis was committed to avoiding a confrontation with the ECB, which was bent on smothering Greece starting from February 4. His position on key issues such as debt went against Syriza’s programme, but that was not enough to earn it the support of European policymakers, who refused to make concessions to a government which was too radical in their eyes. Varoufakis says that during the electoral campaign’s last phase, Alexis Tsipras received a message from Jörg Asmussen, 2 an adviser to the leaders of the SPD, a member of the coalition government led by Angela Merkel. Asmussen offered to help a prospective Syriza government in the forthcoming negotiations with the European institutions. He suggested extending the current Memorandum so that the government could buy some time to continue the reforms stipulated by the Troika before signing a new deal. Jörg Asmussen recommended a collaboration between the Tsipras team and Thomas Wieser (Austrian Social Democrat), who was (and still is) a key player in the Eurogroup and was seen as a potential ally of the Greek government during its upcoming negotiations. A written note from Thomas Wieser was attached to Jorg Asmussen’s email. It informed Tsipras and Varoufakis as to what Wieser believed, namely that the ECB had no plans to pay what it owed Greece — that is, reimbursement of profits the Bank made on the Greek securities it held. This contradicted the ECB’s assurances of 2012. 3 The amount owed but never remitted to Greece was nearly €2 billion, which is a considerable sum for such a small country. This was equivalent to the estimated cost of implementing the humanitarian measures Syriza had promised (see Text Box: Excerpts from the Thessaloniki Programme). Unofficially, they also came to know that the Troika was not going to disburse the sums pledged in the second Memorandum, which expired on February 28, 2015. The IMF and EFSF were supposed to make these payments before the Memorandum’s deadline. 4 Thus, the warning was loud and clear: the Troika was going to financially asphyxiate the upcoming government led by Syriza. In this document received before the elections, Thomas Wieser indicated that the opportunity to extend the second Memorandum for an indefinite period must be seized. In his reply, Varoufakis insisted that the ECB must pay what it owed to Greece — that is, the profits it had made from the Greek securities it held. At the same time, Varoufakis agreed that the prospect of extending the Memorandum beyond February 28 was crucial. Then everything happened very fast. Syriza swept the January 25 elections and the Syriza–ANEL government took office on January 27. Let me remind you that Lafazanis opposed the capitulation of July 2015, resigned as minister, voted against the third Memorandum as an MP, and left Syriza with around twenty MPs and many activists to form Popular Unity, a new political party. Finally, Varoufakis convinced Tsipras to appoint Tsakalotos as Alternate Minister in charge of economic matters within the Ministry of Foreign Affairs, so that he could participate in all the negotiations with the policymakers and be on all the trips to Brussels. Varoufakis explains that in his first three days in office he buckled down to organizing his ministry, putting his team of collaborators to work, estimating the liquidity available to the government for servicing the debt and running the State apparatus (payment of pensions and civil servants’ salaries etc.) He was told that it would take “anything between eleven days and five weeks” to settle the last issue. Varoufakis also explains that the Troika had already debilitated his ministry immensely: three areas under his jurisdiction were partially off-limits to the minister – the department in charge of the recapitalization of private banks (the Hellenic Financial Stability Fund or HFSF), the department responsible for privatization (the Hellenic Republic Asset Development Fund or HRADF), and the administration for tax collections, headed by a CEO from the private sector. The horses have bolted, Yani,’ he said, showing me a decree that had arrived that evening from the deputy prime minister’s office, fully authorized by the cabinet secretary. It stipulated that jurisdiction over all matters pertaining to the banks had been moved from the Ministry of Finance to the office of the deputy prime minister. As I have shown very clearly in the first part of this series, this proposal to hand over the banks to the European creditors went against the Greek people’s interests. This was one of Varoufakis’s six sine qua non conditions for agreeing to become finance minister. It is extraordinary that he gave it up in the very first days of his ministry. This was only the beginning of a long series of broken promises. Varoufakis explains that he embarked on various significant projects along with his team. Some are extremely interesting: “developing the parallel payments system” in case of conflicts with the creditors; the campaign against the previous government’s decision to promote gambling for increasing public revenues; certain measures to counter widespread tax evasion, etc. On January 30 in Athens, Varoufakis held his first meeting with Jeroen Dijsselbloem, the Dutch “social-democratic” minister who was then the President of the Eurogroup. A press conference followed and it was largely instrumental in presenting an immensely radical image of Varoufakis to the public eye, nationwide and abroad. TV channels from all over the world telecast the clash between Varoufakis and Dijsselbloem. Varoufakis defied an arrogant Dijsselbloem, who was obviously rude to a minister he had come to meet. The Thessaloniki Programme, presented in September 2014, promised to terminate the second Memorandum and introduce a national reconstruction plan instead, abolish most of the public debt, discontinue the austerity measures, reinstate the Greek people’s social rights, restore wages and pensions to where they were before the first Memorandum of 2010, end privatization, nationalize the banks, establish a public development bank, reduce the private debts of low-income households towards the State and the private banks, create 300,000 jobs, and revive democracy (see Text Box: Excerpts from the Thessaloniki Programme). Of these six priorities, only the second and fifth corresponded to the Thessaloniki Programme, but these were abandoned after the agreement of February 20, 2015 (see below). We assume responsibility and are accordingly committed to the Greek people for a National Reconstruction Plan 24 that will replace the Memorandum as early as our first days in power, before and regardless of the negotiation outcome. Measures for small pensioners. 30 We have already pledged to restore small pensions in phases. We are also committing today to reinstate the 13th pension, to 1,262,920 pensioners with a pension up to €700. This measure will take place progressively and, depending on the economic situation, will be available to all retired persons and all salaried employees. The second pillar is centered on measures to restart the economy. Priority will be given to discontinuing the current fiscal policy which is being pursued despite its harmful effects on the real economy, 32 to implementing a new seisachtheia, 33 and to “injecting liquidity and enhancing demand. Our economy is abysmal today. Excessive taxation on the middle class as well as on those who do not tax-evade has entrapped a great part of citizens in a situation which directly threatens their employment status, their private property, no matter how small, and even their physical existence, as proved by the unprecedented number in suicides. The labourers, the farmers 34 , the wage-earners, the small and medium entrepreneurs, in short the very body of the real economy is plagued by taxes which it is powerless to resist. Soon they will have to face a new pandemic: banks will seize their private properties since it is difficult for them to repay the loans they contracted before the crisis, before their jobs were gone, before the assault on their income and the shutdown of their businesses. With every passing month, the amount goes up by €1 billion. With these steps, not only do we hope to offer respite to the suffering people who form the backbone of the economy, but also boost the real economy by freeing it from the tentacles of the taxes and surcharges that are totally unproductive because not collectible. When the debts and the down-payments are regularized, necessary funds for tax relief and an equitable burden-sharing will be our immediate rewards. Moreover, as part of the measures to revive the economy we are announcing an immediate repeal of the new property tax. We will introduce a socially fair Large Property Tax (FMAP) and no one will be taxed on imputed income. The tax calculation for seized property will be immediately raised from 30% to 35%. That tax will be progressive with a high tax-free threshold. With the exception of luxurious homes, it will not apply on primary residence. 5. We are setting up a public intermediary organization for the handling of private debt. Obviously, this will foil the confiscation of citizens’ property and the control wielded over the private sector on the pretext of debt. I said it last year, here at the same podium, and I am repeating it this year: the key to salvaging the economy is the financial system. With a Syriza government, the public sector will regain its control over the Hellenic Financial Stability Fund (HFSF) and it will have rights over recapitalized banks. 40 This means that the public sector will now decide how the banks are run. At the same time, we are taking steps to ensure liquidity in the real economy. These include the establishment of a public development bank as well as of special-purpose banks. 6. Setting up a development bank and special-purpose banks. The new model of the banking system will include, in addition to the phased recapitalization of banks, specific cooperative banks and a public development bank. That’s why we’re going to create a development bank 41 and special-purpose banks for financing SMEs and farmers, and for providing necessary liquidity so that dynamic professional teams can be built, who, in their turn, will give their best to growth and economic regeneration. 7. Restoration of the minimum wage to €751. Our econometric model echoes the conclusions of the INE-GSEE (the Labour Institute of the General Confederation of Greek Workers): growth is not hampered by the cost of restoring minimum wage, on the contrary, such a restoration is beneficial. The third pillar of the National Recovery Plan presented to you today has been tailored to our great national goal: to provide jobs to all, to restore hope and prospects to our young people who have been emigrating in hordes, but it is their strength that we need to reconstruct our country. Abolition of all regulations allowing for massive and unjustifiable layoffs as well as for renting employees. (...) We shall progressively empower the regional authorities and reinforce their active participation in the nation’s economic regeneration. We shall empower the institutions of representative democracy and… introduce new institutions of direct democracy in the political system, such as people’s legislative initiative, people’s veto and people’s initiative to call a referendum. We shall empower both the legislative and executive functions of the Parliament, 46 strictly execute the curtailment of parliamentary immunity and repeal… the peculiar legal regime of MPs’ non-prosecution in terms of criminal liability that institutionalizes a vicious deviation from the principles of a democratic society. We do not make promises. We commit ourselves. (...) We have already chalked out a roadmap for six months to combat this cancer. To start with, it will be prompt and more vigilant in monitoring intra-group transactions, “Lagarde lists,” Liechtenstein, remittances, offshore companies and overseas real estate. The revenues likely to be generated from crackdowns on tax evasion and smuggling have sometimes been greatly overestimated. Our modest guess is that our action plan will bring at least €3 billion euros to the state coffers in the first year. Contrary to the caricature presented in the dominant media and by the governments of the creditor countries, Varoufakis, as chief negotiator, made very moderate propositions to the Troika which were a setback, or even in contradiction with the Thessaloniki Programme. He assured the “Adults” that the Greek government was not asking for a reduction of the debt. He suggested that the different forms of debts held by the Troika be exchanged for new issues over a longer period, thus reducing the annual strain on the Greek budget. He did not dispute the legitimacy or the legality of the debts. This is very serious. He did not point out the right and the will of the Greek government to conduct an audit of the debt. In his book there is no mention of the debt audit commission created by the President of the Greek parliament. Not one word. This certainly was not because this initiative was not known in Greece. On the contrary, it was very well spotlighted. Varoufakis chose to remain completely silent on the debt commission because it did not enter into his vision of the negotiations. He proposed to redraft a part of the ongoing Memorandum in order to prolong it and to adapt certain of the measures it proposed. He repeatedly affirmed that 70% of them were acceptable. He added that many measures that could be applied were positive but that 30% of the Memorandum should be replaced by measures that would have a neutral effect on the budget. That meant introducing new measures, particularly to ease the humanitarian crisis, which would not increase the deficit that the Samaras government had budgeted because they would generate increased revenues or have the result of reducing spending in certain areas. Varoufakis confirmed that the government that he represented would not challenge the privatizations that had taken place since 2010, and moreover, more were possible on condition that the price was right and the buyers respected the labour rights. Varoufakis also confirmed that Greece could not be salvaged unless it remained in the Eurozone. He held back any mention to the opposing negotiators that the Syriza party programme implied that the Greek State would exercise control over the private banks of which it was the majority shareholder. One of the truly radical elements in Varoufakis’s discourse is that on several occasions at the start of his period in office he said plainly that the Troika was not democratically legitimate and his government would not collaborate with it. However, when referring to his book it is evident that in practice he accepted the Troika. It only disappeared in words. The only concession the Troika made was to agree to the pretence that it did not exist. Although the Troika played hide and seek it knew how to make its presence felt. Varoufakis shows that the Troika was always present and real at all the key moments of negotiation and of decision taking. In continuing to repay, the situation could only get worse. The problem is that in accepting, on 20 February, to continue all debt payments according to plan until 30 June 2015 he accepted a situation worse than the hellish one described above because the creditors had not taken on any promise to make the least payment. €7 billion would be needed before the end of June 2015. That sum must be compared with the €2 billion needed by the Thesaloniki Programme to meet humanitarian needs, to the end of 2015. My own figures show that because of debt repayments, no more than €200 million was spent by the Tsipras government between February and June 2015. Quite insufficient. It was clear that in continuing to repay without the guaranty of receiving fresh money the situation could only get worse. It was just as clear that the second Memorandum had to be followed by a third for the creditors to grant new loans to repay the previous ones. Varoufakis’s claim that another outcome was possible was only a fanciful belief that the creditors could be simply persuaded to allow Greece to end the most antisocial of the austerity measures, the shackles of the Memorandum, and to reduce the size of repayments during 2015 (without changing the outstanding capital). This position could not hold water. At the meeting on 30 January between Varoufakis and the President of the Euro-group, Jeroen Dijsselbloem, the latter clearly indicated that he was not interested in the mandate that the Greek people had granted to the Tsipras government. He refused to replace the Memorandum with a new agreement and would not even modify the Memorandum as it existed, saying that the European Central Bank could prevent Greek banks from having normal access to liquidities. In order to change the situation, Varoufakis looked for some support and met the French and Italian leaders (hoping to find support from their so called “socialist” governments in loosening the grip of austerity policies) and the British leaders who at the time were seeking to turn their economy around even if that caused a bigger deficit. Then he went to Frankfurt to try to sweet-talk the ECB and finally to Berlin. Before going a meeting was held with Tsipras, Pappas, and Dragasakis. Varoufakis got the green light to not ask for a morally sound debt write-off. In so doing Varoufakis renounced a fundamental argument before international public opinion that could have put the creditors into difficulty on one their weakest points. Varoufakis recognized that the secret agreement at this meeting was in contradiction with the official Syriza orientation: “Syriza’s position on public debt had been nothing more than a crude demand for an unqualified write-down. With half the party still demanding a unilateral haircut of most of the debt, most not even privy to the idea of a debt swap, and with only a tenuous, verbal covenant binding the leadership trio to my strategy.” 52 Thus Varoufakis rejected the programme on which Syriza had been elected to government and rebuffed the Syriza base. As from 1 February, a week after Syriza formed its government, Varoufakis began his first tour of Europe as a Minister in the company of Euclid Tsakalotos. On Sunday the schedule was tight: an official meeting with Michel Sapin, French Minister of Finance, another with Emmanuel Macron, French Minister of the Economy and four unofficial meetings with Poul Thomsen, deputy director of the IMF for European affairs, Pierre Moscovici, European commissioner for economic and monetary affairs, Benoît Cœuré, second in command at the ECB and with Francois Hollande’s Secretary. On Monday second February he was in London with George Osborne, the Chancellor of the Exchequer (Minister of Finance), after which he gave a talk to two hundred financial actors invited by the Deutsche Bank. The next day Varoufakis went to Rome to meet the Italian Minister of Finance, Pier Carlo Padoan. Finally, on the 4th he had a meeting in Frankfurt with Mario Draghi and the executive council of the ECB. Varoufakis at each occasion proposed an exchange of debt without reduction or write-down. 53 He made it clear that the Greek government would pay private sector debt on the nail (about 15% of the Greek debt was held by private holdings — Greek or foreign banks, investment funds or vulture funds, among others). Varoufakis demonstrates the rampant hypocrisy in the leaders he met. Michel Sapin seems to take the cake for duplicity: behind the scenes he was very encouraging to the proposals to exchange debts and make far-reaching amendments to the Memorandum and show solidarity with the Greek government. Then at the press conference he adopted a completely different position. Then at the press conference Sapin adopted a completely different position, saying that the Greek government should respect its obligations to its creditors and that Tsipras should apply the agreements signed by previous governments. European Commissioner Pierre Moscovici treated Varoufakis like a comrade with whom he was going to change the whole of Europe. 55 Varoufakis quickly realised that Moscovici was not at all acting as one would expect from an ally to the Greek government. All through the book Varoufakis speaks very highly of Emmanuel Macron, who at the time was the french Minister of Economy. The first contact with Benoît Cœuré, a Director of the ECB, was very revealing. He came straight to the point — did the government have, or have not, the intention to restructure unilaterally the Greek government bonds that the ECB owned? Putting the issue in this urgent fashion plainly revealed it was what the ECB feared more than anything else. It was a perfectly feasible option that Varoufakis had mentioned several times before becoming Minister. The values in question had been issued under Greek jurisdiction over the 2010-2011 period. The ECB had bought them at 70% of their value but counted them at 100% while at the same time demanding excessive interest rates. Equivalent values held by Greek pension funds had undergone a “haircut” of 53% in March 2012. The ECB had refused that the same measure be applied to the values it held. The Greek government would have had the moral, and indeed the legal, right to take such an action. It will be seen further on that, finally, the Greek government never would take such action on the ECB-held values, even though it should have done so and would have had a very good chance of winning the issue. The IMF was continually making declarations to mystify the Greek government and public opinion. Telling Varoufakis to “erase” €53 billions of bilateral debt to Eurozone countries cost the IMF nothing. It had no intention of agreeing to a reduction on the Greek values it held itself. It was a diversion that was used several times. Independently of these declarations, the IMF had always heavily insisted that Greece follow brutal neoliberal policies. In the end, that is where the strategy that Tsipras and Varoufakis choose together. The Italian “socialist” Minister’s words contain profound truth. The reasoning of the European leaders is to inflict the easing of constraining labour legislation and lower wages to render European goods and services competitive in the face of foreign-produced merchandise and services. The conditions inflicted on Greece are part and parcel of this strategy and Varoufakis has refused to understand that or radically oppose it. The enormous Greek debt is a fundamental weapon used by the public creditors to make an example of Greece to drive home what it costs to any people who may resist their power, and of course to strip workers of their rights. On 4 February in Frankfurt, Varoufakis met ECB directors: Mario Draghi, its President, and three others — the Frenchman Benoît Cœuré, the German Sabine Lautenschläger and the Belgian Peter Praet. Varoufakis was still accompanied by Euclid Tsakalotos. This requires explanation. The ECB provides liquidities to the banks in the Eurozone. To gain access, the banks (whether public or private) must deposit financial securities as guaranties. This is called “collateral.” The collateral may be of different types, such as, among others, public debt securities or securities on private corporations. The ECB may consider that the instruments that are deposited are doubtful, either because they lack sufficient guarantees or are low quality. In this case it may block access to further funds. This provokes doubt and a “run” on the banks. So, the ECB decided on 4 February 2015 to immediately apply extreme measures on the Tsipras government. Not moral pressure or coercion from ECB but direct aggressive action, as Varoufakis describes it in the passage cited above. The effects of such decisions are, in fact, immediate. First, the Greek banks are forced to pay higher rates to have access to liquidities. This weakens their positions. Second, short-term financing for the Greek State becomes much more difficult. This meant that the liquidities granted by the ECB were used to purchase short-term (less than one year) Greek treasury bills. This permitted the Greek government to keep going (Eurozone governments cannot borrow from their own central banks). As the ECB was limiting liquidities, the Greek government had to borrow from Greek banks at much higher interest rates, thus adding to the Greek debt burden. So, by reducing Greek banks’ liquidities and increasing the cost of financing, the ECB made it more difficult for the Greek treasury to find funds from the Greek banks. 68 At the same time, on the one hand, other private foreign funding was difficult to find, or downright non-existent. On the other hand, as we have seen, the ECB no longer intended to cede to Greece the profits that it had made on its debt (€2 billion should have been reimbursed over 2015). This also was a purely political decision. In 2014 the ECB had made some reimbursements to the Samaras government even though it was behind in applying the second Memorandum. Even before the result of the election of Tsipras was known, emissaries of the Euro group and the ECB made it known that the promised €2 billions would not be paid. Finally, because the ECB considers that securities lose their value because of the situation of the banks, as well as of the State, deteriorates, this increases withdrawals and further restricts the State’s access to funds. There is further proof of the politically aggressive nature of the ECB’s decision to cut off liquidities to Greek banks. As we have said, the ECB may consider that a country’s banks are of such high risk that they should not receive further liquidities and a rescue plan should be applied to them, for example, by injecting fresh capital (which had been done in the framework of different Memorandums). The problem for the ECB is that in June 2014 all the Greek banks had passed the European banking authority stress test. It was clear that the result had been overvalued in order to justify the ECB helping Greek banks during the period of the Samaras government, who had just lost the European elections to Syriza. What is certain is that the banks were in a very bad way, in 2009 as in 2014 and in 2015. The ECB pretended surprise in discovering the real situation just days after the election of Tsipras. This was all purely political manoeuvring. On the morning of 4 February, how did Varoufakis, who describes the decision of the ECB to restrict normal access to liquidities to Greek banks as a premeditated act of aggression, react to this news? Very moderately! Unbelievable! I began my reply by expressing my great and genuine respect for the manner in which Draghi had striven from the first day of his presidency to do whatever it took to save the euro while adhering as far as possible to his bank’s charter and rules. This skilful balancing act was what had bought Europe’s politicians the time they needed to get their act together, address the crisis properly, and thus alleviate the impossible circumstances in which the ECB had found itself: responsible for saving the eurozone’s failing economies while being prohibited from using the essential means – ones available to any normal central bank – of doing so. Not a word on the brutality of the ECB since 2010, nor on the scandalous profits made by buying Greeks bonds between 2010-2012. On the contrary, Varoufakis compliments the Board of the ECB for its “fantastic job” Then he continues by again proposing to exchange values in order to avoid reducing the value of the Greek bonds held by the ECB. How could Draghi interpret that? The only conclusion he could come to was that if that afternoon the decision was taken to close Greek banks’ access to liquidities, without going so far as to actually close them, there would be no great reaction from the Greek government. So it was done! In doing so, this put pressure on the Greek government, started to stifle it and bring it to bay in the hope of extracting concessions. Another criticism can be made about Varoufakis’s proposal. Whereas he himself, several times before he became Minister of Finance, had denounced the unacceptable, abusive, and highly scandalous nature of the ECB operation on the Greek securities bought during the 2010-2012 period, he proposed to Draghi a “money laundering” operation. These old securities (which are dubious, to say the least) are replaced by new securities that carry the same value (but at lower interest rates). We must realize that by doing so, Varoufakis made it almost impossible to apply a Plan B (which included the unilateral haircut proposal): if the negotiations failed, it would then be difficult to explain to journalists and public opinion that the Greek government has the right to apply a unilateral haircut. Indeed, if Greece was prepared to exchange its debt securities held by the ECB for securities of the same value, why should it then be right for it to apply a discount? Consistency in argumentation is necessary to convince. The government should have told the truth loud and clear about the scandal of Greek securities purchased between 2010 and 2012. That consistency was wanting in Varoufakis’s reasoning. Moreover, it is obvious that this proposal by Varoufakis had absolutely no chance of success because it would have set an unacceptable precedent for those in favour of austerity. The problem is not technical: Varoufakis’s proposal did not raise any real technical problem. The obstacle was and still is political: European leaders are totally opposed to the idea of allowing European states (whether they are in the Eurozone or not) to pool their debts because this would remove a major possibility of pressure for continuing the neoliberal offensive. Varoufakis’s proposal went completely against the logic of the most recent European treaties. It had no chance of success and the negotiating strategy should not have been based on this fantasy. The demand included in the Thessaloniki Programme should have been put forward: the cancellation of most of the debt, explaining that it was illegitimate, odious, illegal, and unsustainable. Of course, European leaders could not accept this request but the Greek government could develop an international campaign of explanation in order to gain broad public support. It could initiate an audit process and declare a moratorium until the audit was completed. Payment suspension had to be urgently decreed, for instance on 12 February 2015. Indeed, between 12 February and 30 June 2015, Greece was to repay €5 billion to the IMF (see table below :). If we take into account the other amounts to be paid to the IMF in 2015, an additional €3 billion must be added. The ECB demanded repayment of more than €6.5 billion to be made in July-August 2015. Action also had to be taken regarding banks. As the ECB took the initiative to sharpen the Greek banking crisis, it was necessary to act at this level as well and implement the Thessaloniki Programme which said: “With Syriza in government, the public sector will take over control of the Hellenic Financial Stability Fund (HFSF) and exercise all its rights over the recapitalised banks. That means that it will make decisions about the way they are run.” It should be noted that in 2015 the Greek State, through the Hellenic Financial Stability Fund, was the main shareholder of the four largest banks in the country, which accounted for more than 85% of the total Greek banking sector. The problem is that, because of the policies pursued by previous governments, its shares had no real weight in the banks’ decisions because they did not entail the right to vote. It was therefore necessary for the Parliament, in accordance with what Syriza had pledged, to transform the so-called preferential shares held by the public authorities (which do not entail voting rights) into ordinary shares giving the right to vote. Then, in a perfectly normal and legal way, the State could have exercised its responsibilities and provided a solution to the banking crisis. Finally, two important steps still had to be taken. Firstly, in order to deal with the banking and financial crisis sharpened by Stournaras’s statements since December and by the ECB’s decision on 4 February, the government should have decreed a control of capital movements in order to put an end to flight of capital out of the country. Secondly, it should have set up a parallel payment system. Varoufakis claims that he had a concrete proposal in this respect but he did not propose to implement it following the ECB’s aggression on 4 February. We shall comment on the alternative strategy to be followed in relation to the debt and on the banking crisis further in this series. Varoufakis embarked on a process of denial of reality that was to lead him and the narrow circle around Tsipras to enforce a fateful agreement on the rest of the government, Syriza and the Greek people on 20 February 2015, i.e. less than a month after the election victory. Of course, the Troika members are primarily responsible for the destructive content of this agreement and we have consistently denounced them, but Varoufakis-Tsipras could have refused to sign such a dire agreement. In the next article, we will analyse the path followed towards the first surrender to the creditors and specify the alternative path that should have been taken.Thanks to Marie-Laure Coulmin-Koutsaftis, Nathan Legrand and Claude Quémar for their careful rereading and for their wise pieces of advice. 2. Yanis Varoufakis, Adults in the Room: My Battle with Europe’s Deep Establishment (London, The Bodley Head 2017) Chapter 5. 4. Yanis Varoufakis, Adults in the Room, Chapter 5. See also note 15 for this Chapter where Varoufakis goes into more details. 5. Tsakalotos was considered to be a part of Syriza’s centre-left contingent, known as the group of 53. As I wrote in Part 3 of this series, I met Tsakalotos in spring 2014 in Brussels and realised straightaway that he opposed all radical positions on the debt issue. He did not at all support a Plan B in case Syriza’s conciliatory attitude towards the creditors failed to get results in terms of debt reduction. The subsequent events clearly showed that Tsakalotos became complicit in an orientation that led to the July 2015 capitulation. Then he became just one more politician who continuing the offensive against social rights. 10. See the first part of this series: Éric Toussaint, "Yanis Varoufakis’s Account of the Greek Crisis: a Self-Incrimination — Part One: Proposals Doomed to Fail." 11. Wassily Kafouros was a friend of Varoufakis who helped him out in the ministry. It was he who, just over a year before, had warned Varoufakis that the Greek bankers were friends with Dragasakis and that Varoufakis should keep his eyes open. 12. Varoufakis, Adults in the Room, Chapter 6. 16. Yanis Varoufakis, Adults in the Room, Chapter 4. 17. I cited those six measures, with my comments, in the first article of this series. See the first part of this series: Éric Toussaint, "Yanis Varoufakis’s Account of the Greek Crisis: a Self-Incrimination — Part One: Proposals Doomed to Fail"
18. Yanis Varoufakis, Adults in the Room, Chapter 4. 19. The citations within quotes have been directly reproduced from https://www.syriza.gr/article/SYRIZ...and the rest of the citations have been translated from Ensemble!. Emphasis added by the author. 20. Varoufakis did not support this demand. He proposed a debt swap (by changing the debt repayment deadlines and by cutting down the rate of interest) without reducing the debt stock’s nominal value. 21. During the London Conference, on February 27, 1953, the Federal Republic of Germany decreed a 62.6% debt reduction with the consent of 21 of its creditors, including the United States, Great Britain, France, Italy, Switzerland, Belgium, Greece, etc. See: Eric Toussaint, "The cancellation of German debt in 1953 versus the attitude to the Third World and Greece." Greece’s debt was not reduced despite Tsipras’s capitulation. 22. This means that such expenses would not be considered while calculating the deficit. This directly contravenes the European Commission’s stipulations. 23. The President of the Greek Parliament had launched a Commission, but the government did not bother to use its findings during its negotiations with Germany. 24. This promise was not kept and on February 20, 2015 the government agreed to extend the Memorandum. 25. In fact, the only steps taken during the six months of the first Syriza-ANEL government were the 100 instalments that allowed the taxpayers with financial obligations to the State to regularise their accounts and to recover a legitimate fiscal identity, necessary for engaging in any economic activity. This measure lost its steam in August 2015, thanks to a specific article of the third Memorandum. 26. Greece has not yet been able to provide free electricity to the poorest households. 27. Nothing materialised in 2015, the year of “negotiations with the creditors.” In December 2016, Tsipras announced a “Parallel Plan” which provided for a Social Solidarity Income. As of end 2017 it has so far been allocated to 280,000 households, comprising around 620,000 people. It is expected that 700,000 people living in extreme poverty in Greece will benefit from it in 2018. This monthly allowance is determined by each household’s income and property and comes with various services such as free school meals, free health care and medicines, access to municipal social services (social grocery stores, etc.). Please note that 35.6% of Greeks are living below the poverty line at end 2017. 28. Since May 2016, all Greeks, with or without social security, have free access to medicines and medical facilities. This is also applicable to asylum seekers and vulnerable people. However the health system has been steadily deteriorating since the first Memorandum, leading to severe medicine shortages, long queues and overloading of services in the hospitals, closures of entire provincial facilities, lack of staff and funds etc. 29. Nothing has been done so far. 30. The Katrougalos law of 2016 amended the pension scheme and introduced reduced auxiliary pensions with the goal of saving 1% of GDP by 2019. New supplementary pensions have not been granted since January 2015, while this law will phase out the EKAS benefits applicable to the lowest pensions by 2020. 32. On the contrary, the fiscal situation of SMEs took a nosedive with the third Memorandum, which imposed an advance payment (by next December) of 50% of the VAT (increased to 24%) on the turnover expected for the following year. 33. “Burden Relief” or Debt Cancellation, was a measure introduced by Solon, Athens, in the 6th century B.C.E, to help debt-ridden people. See Daphne Kioussis, [“Solon et la crise d’endettement dans la cité athénienne-14972]”(in French) - (Solon and the debt crisis in the city of Athens). 34. Farmers in particular came in the crosshairs of the third Memorandum signed on July 13, 2015: a major hike (from 7% to 20%) in the social-security contributions for pensions; advance payment of 50% of VAT on the profits estimated for the following year; cancellation of the exemptions on diesel fuel; and withdrawal of a series of subsidies. 35. Between 2014 and October 2017, while the Tsipras government was pursuing the same policies it denounced in 2014, tax arrears increased from €68 billion to almost €100 billion. Since January 2017, the Independent Authority for Public Revenue (which replaced the tax department of the Ministry of Finance) conducted raids for property seizures without sparing primary residences. The total tax liabilities in August 2017 were €95.65 billion, including €5.48 billion for the year 2017 alone, and 3.8 million indebted taxpayers. Among them 2.4 million taxpayers, persons or legal entities, have a debt of €1 to €500, for a total sum of €340 million. They are unable to pay even this amount. 36. The ENFIA has not been withdrawn. It has been slightly modified according to the geographic location or the condition of the properties, and now varies between €400 to €13,000 p.a. 37. After numerous negotiations, the threshold for taxable income has been set at €8,600 p.a. for a single person and €9,000 p.a. for a couple with two dependent children. The situation is bound to deteriorate because, buckling under the Troika’s pressure, the government has lowered the threshold to €5,700 and €6,130 respectively, effective from Jan 1, 2019. 38. This involved canceling the bank debts of destitute people living below the poverty line. 40. Varoufakis was opposed to this measure, since he wanted to transfer the “shares and management” of the Greek banks to the European creditors. As for the Tsipras government, it has not taken any action yet so that the Greek state can exercise its rights over the recapitalized banks. Moreover, the Hellenic Financial Stability Fund has been left in the hands of the close associates of the private bankers and the European leaders. 41. The public development bank is yet to materialise. This was one of Varoufakis’s six priority measures, but he agreed to removing the provision in the agreement with the Eurogroup in February 2015. Yanis Varoufakis, Adults in the Room, Chapter 10. 42. This has not been achieved. The second Memorandum reduced the basic wage to €586, and €510 for those under the age of 25. Since January 1, 2017 it has been raised to €684, regardless of age, but it has not been restored to the level of 2010-2011, i.e. €751. 43. Since 2015, with every “review” preceding the disbursement of the tranches, labour rights have been violated so that the Troika’s diktats could be obeyed. The law decreed in May 2017 paved the way for collective firings, scrapping the mandatory administrative approval and the Minister of Labour’s veto power. Layoffs will now depend on the job market situation, the company’s state of affairs, and the interests of the national economy. Labour rights went further downhill in January 2018 with the adoption of a law that limits the right to strike. Finally, the law keeping retail stores open on Sundays has not been withdrawn, despite repeated protests from the majority of merchants and their employees. 44. This has not materialized. 45. This has not materialized because the Development Bank has yet to be established. 46. During its first six months, the Tsipras government made only partial headway in this regard, despite the efforts of the President of the Greek Parliament. This was due to the arm-twisting by the creditors and Tsipras’s propensity for secret diplomacy and appeasement. 47. The Tsipras government fulfilled this pledge in June 2015 but, as Varoufakis points out, by means of appointing a dubious character as the CEO of the state radio and television. This appointment led to strong protests and it disapointed the left immensely. 48. This has not yet materialized. 49. In his book, Varoufakis explains why he agreed with the creditors that this 11 billion should not be doled out to the Greek government but repatriated to the EFSF (a private organisation established by the Troika with its headquarters in Luxembourg) instead. To him, the pursuit of that 11 billion was a lost battle. See Varoufakis, Adults in the Room, Chapter 9 and footnote 14 for Chapter 9. 53. As he himself indicates, Varoufakis’ main proposal in terms of debt restructuring is in line with the text entitled Modest Proposal for Resolving the Euro Zone Crisis. Carrying out this proposal, which consisted of pooling public debts in the Eurozone, would have involved a joint decision by the governments of the Eurozone so as to provide relief to public finances and to leave austerity policies behind. 65. Varoufakis writes: “Since 15 December, when Stournaras accelerated the bank run that Prime Minister Samaras had begun, depositors had withdrawn €9.3 billion from Greek banks, and the rate of withdrawals had hit €1 billion daily. By the time of the election, €11 billion would have found its way abroad or under mattresses. To be able to pay out so much money, the banks had had to increase their dependence on the ECB to the tune of more than €60 billion.” Varoufakis, Adults in the Room, Chapter 5. 67. In 2014 already, Varoufakis had claimed that it would not be necessary to replace Stournaras if Syriza came to power. Varoufakis tells about a conversation he had at a meeting with Tsipras, Pappas, Dragasakis, Tsakalotos and Stathakis in June 2014: “‘Is it a coincidence that three days from today Prime Minister Samaras will transfer Stournaras from the finance ministry to the governorship of the central bank?’ I asked. ‘It’s obviously a stratagem in anticipation of your electoral victory.’ At that point Alexis grew angry. ‘The first thing I shall do as prime minister is demand Stournaras’ resignation. I will drag him from the central bank kicking and screaming if need be.’ Pappas offered a number of even more drastic solutions to this problem. I pointed out that it hardly mattered who sat in the governor’s office.” Varoufakis, Chapter 3. Another passage in Varoufakis’s book shows that he told Tsipras he should not get rid of Stournaras: “Alexis had repeatedly told me and others that removing Stournaras was his top priority. Ironically, I had advised moderation and tempered his animosity towards Stournaras, pointing out that the government could not remove the governor of the Bank of Greece without a major clash with the ECB’s executive council.... But in trying to contain Alexis’s fury towards Stournaras, I had created the impression among the Syriza leadership that I was soft on the troika’s favourite son in Athens.” Varoufakis, Chapter 10. 68. Private banks receive cash with which they buy government securities for profit. Then they deposit these securities as collateral with the central bank in order to obtain liquidity (credit) that they use to buy other public securities (Greek banks are granting less and less credit to the private sector and the share of non-performing loans in their credit portfolio is increasing at a rate of 45% in 2015. So they are lending more and more to the state because it is safer than lending to the private sector). If the central bank limits access to liquidity, banks buy less securities and demand a higher yield, which increases the cost of borrowing for the government.